Advocate David Unterhalter SC is one of South Africa’s foremost silks and has appeared in various high profile cases which have landed up in the Supreme Court of Appeal and the Constitutional Court. Some of the matters in which Unterhalter appeared in include President of the Republic of South Africa v Masethla, which dealt with a constitutional challenge to classified documents; Eisenberg v Minister of Home Affairs, regarding the constitutionality of immigration regulations and Islamic Unity Convention v Minister of Telecommunications which grappled with hate speech and the right to freedom of expression. He also headed Deputy President Cyril Ramaphosa’s legal team at the Marikana Commission, set up to investigate the 44 deaths — 34 killed by police in a massacre — during an unprotected strike at the Lonmin platinum mining operation in the North West province in 2012. 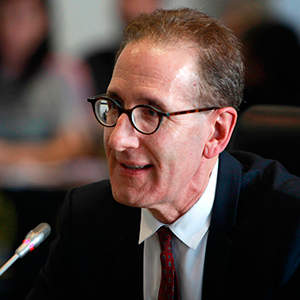 He is a member of the Helen Suzman Foundation, which has taken government, and the JSC, to court over administrative law issues — Unterhalter has usually led the FUL legal team in these cases. Unterhalter holds a BA from the University of Cambridge, an LLB from the University of Witwatersrand, a Bachelor of Civil Law from University of Oxford and an MA from Cambridge. The son of renowned lawyer Jack Unterhalter, who represented many political prisoners facing the death sentence during apartheid, David has worked as both an academic and lawyer during his career. He has lectured and held positions at all his alma maters and was also visiting professor at the Columbia Law School in New York. Between 2006-2013 he was a member of the appellate body of the World Trade Organisation and served as its chairperson over a period. At the time of his October 2017 interview Unterhalter had a meagre 11 weeks acting experience in the high court. En-route to court for one of those days on the Bench he was held-up at gunpoint in Johannesburg’s morning rush-hour traffic. The Judicial Service Commission (JSC) can be schizophrenic when dealing with smart, but smooth, white male lawyers whose privilege is obvious in their success. Sometimes commissioners attack rigorously — occasionally viscously — the candidate’s perceived subliminal racism, sexism and superiority complexes. At others, they appear slightly cowed by the candidate’s track-record. Aside from Chief Justice Mogoeng Mogoeng’s inexplicable attack on Freedom Under Law — which Unterhalter has represented in court — and South African non-governmental organisations (NGOs) in general, nobody got really stuck into Unterhalter. Seemingly oblivious to the work that NGOs and public interest law firms have done — many of which, from social movements like Abahlali baseMjondolo to legal organisations like the Socio-Economic Rights Institute, have ended up before Mogoeng at the Constitutional Court — the chief justice embarked on an untrammelled attack of South Africa’s civil society for a perceived anti-government myopia. Mogoeng said he had “a sense that NGOs show their hand when there is something to challenge about how the country is run, but hardly ever [when it came to] cases of racism, employment equity” and “land redistribution”. During the course of a relentless period of interruptions and further questions by Mogoeng — more “Honey-badgering” than badgering — Unterhalter remained cool. He maintained South Africa had a “vibrant civil society” where the “particular focus” of the work each NGO did meant they “concentrated on particular issues to the exclusion of others”. As an example, Unterhalter reminded Mogoeng about the “significant work around land” that the Legal Resources Centre was doing. Perhaps a letter of support from top advocate Tembeka Ngcukaitobi blunted the commission’s attempt to interrogate Unterhalter’s contribution to transformation. He appeared to be let off relatively easy on questions about the number of black and female juniors he had included in his teams. Advocate Dali Mpofu SC asked Unterhalter about his transformation record as a practising lawyer and in his group. Unterhalter spoke about formalising transformation initiatives at the Bar and in is group, but skirted his own track record. Unterhalter said this perception was “not correct” and that after recently doing an “audit” he found that “black practitioners feature very frequently in teams that I lead”. None of the commissioners pushed Unterhalter on the numbers his audit revealed. Economic Freedom Fighters MP Julius Malema did ask Unterhalter about his “accepting a brief with an all-white team at the Marikana commission, where the candidate had represented Deputy President Cyril Ramaphosa. Unterhalter stood by his line that he didn’t think “it was invariably the case” that one could appoint black or female juniors all the time. Malema pushed Unterhalter on the Marikana Commission and whether he had advised Ramaphosa — who was a non-executive director at Lonmin when the 2012 massacre which left 34 of the company’s employees dead, happened — to apologise for his alleged role in the massacre. Unterhalter said: “I don’t believe my advise on that was ever sought.” A position he maintained in follow-up questions from Malema until Mogoeng cut that line of questioning as being irrelevant to the interview — and then started his own tirade against NGOs.